Top Fueler Clay Millican still has a shot at winning the 2018 NHRA championship – thanks to the Countdown playoffs. 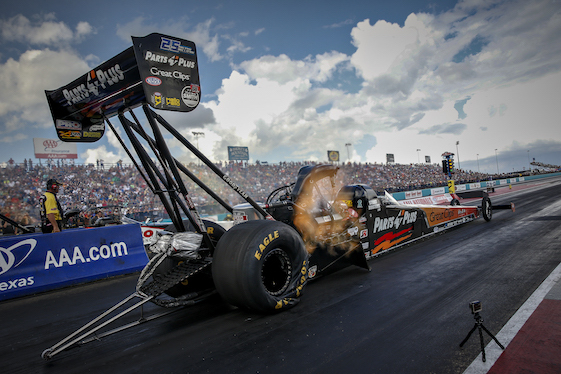 ENNIS, Texas – Competing for Top Fuel championships is hardly a new sensation for Clay Millican. The ever-upbeat Tennessee resident claimed six International Hot Rod Association titles before transitioning to the NHRA ranks and his current gig with car-owner Doug Stringer and crew chief David Grubnic. For the record, Torrence has won seven national events this season to raise his career total to 23. Undaunted, Millican began time trials Friday for the 33rd annual AAA Texas NHRA FallNationals 70-points/three-plus rounds of racing behind Torrence, last season’s championship runner-up to Brittany Force. Torrence ended the 18-race “regular season” as point-leader and immediately staked his claim to the 2018 title by winning the first two of six Countdown to the Championship playoff races. Millican has rallied at Texas Motorplex, leading all four qualifying sessions this weekend and claiming 11 bonus points to momentarily seize momentum heading into Sunday’s final eliminations. A three-time winner this season, Millican earned his ninth pole of 2018 and 19th of his NHRA career with a 1,000-foot run of 3.726-seconds at 328.54 mph in his dragster, setting up a first-round match Sunday against Richie Crampton. Native Texan Torrence, meanwhile, qualified second at 3.743-seconds and 327.83 mph in his Torrence Racing dragster to secure a pairing against Bill Litton. Additionally, eight-time world champ/transplanted Texan Tony Schumacher qualified his Don Schumacher Racing dragster third at 3.745-seconds at 329.58 mph. “The Sarge” has a first-round match against Shawn Reed. Sunday’s race on The Plex’s all-concrete surface is the third of six in the Mello Yello Drag Racing Series Countdown, and 21st of 24 on the 2018 schedule. Tommy Johnson Jr. (Funny Car), Jeg Coughlin Jr. (Pro Stock) and Eddie Krawiec (Pro Stock Motorcycle) also secured No. 1 starting spots at former Funny Car driver Billy Meyer’s stadium-style facility, where the fourth and final round of time trials began with the track temperature reading 116 degrees. Brittany Force (Top Fuel), Robert Hight (Funny Car), Jason Line (Pro Stock) and Krawiec (Pro Stock Motorcycle) were last year’s winners of an event that will be televised on FOX Sports 1 (FS1) and FOX Sports 2 (FS2), including live final eliminations coverage on FS1 Sunday. FS1 will air one hour of qualifying Sunday at 1 p.m. (EDT) and roll into three hours of live finals coverage at 2 p.m.
Johnson posted his first No. 1 qualifier of the 2018 season and 16th of his career in the fourth round, reclaiming the point after Bob Tasca III took the provisional pole in Round 3. Johnson covered the 1,000-foot distance in 3.918-seconds at 321.73 mph in his Dodge Charger R/T fielded by Don Schumacher Racing. Tasca, a non-Countdown participant, settled for the runnerup spot at 3.950-seconds and 322.27 mph in his Ford Mustang. Johnson is mired in a 20-race winless streak dating to his victory in the 2017 season-ending Auto Club Finals at Pomona, Calif., last November. “My boys are pretty happy,” Johnson said. “John is in a really good groove. The car is happy and reacts to every move he makes. For me, when I’ve got a good car it takes the pressure off. I’ll just go out there and race. “And I didn’t want to race Matt (Hagan) first round. I was well-aware of who got No. 2 (Tasca) would get Hagan.” Johnson will face Terry Haddock in Round 1 in search of his first win of the season and 18th of his career. Funny Car point-leader Robert Hight, the two-time/reigning world champ from John Force Racing, qualified sixth 3.979-seconds and 314.83 mph in his Chevrolet Camaro SS, setting up a first-round match with Jim Campbell and his Charger. In Pro Stock, Coughlin secured P1 for the second consecutive Countdown race via his quarter-mile pass of 6.599-seconds at 207.53 mph from Friday night’s second round. A five-time “Factory Hot Rod” world champion, Coughlin earned his fourth pole of the season and 27th of his career. “It feels great first-off to be wearing the green hat,” said Coughlin, driver of the Elite Motorsports Chevrolet Camaro SS. “To qualify No. 1 is really saying something. You look at the top-11 and they’re separated by less than two-hundredths of a second in Pro Stock. Competition is extremely tight right now. Crew chiefs have got all of the cars pretty darn good and drivers are doing their thing to see us all packed up that tight. Jeggie will meet Val Smeland and his Camaro in Round 1 while qualifying runnerup Greg Anderson, a four-time world champ, will meet Alan Prusiensky and his Dodge Dart. Anderson’s best lap in his red Summit Racing Equipment Camaro was 6.600-seconds at 208.42 mph. “I really like the momentum we have right now,” said Coughlin, a three-time winner this season. “It’s pretty simple; we have four races left, one of which awards points-and-a-half (season-ending Auto Club Finals), so that means there are 18 elimination rounds left worth of points. We’re just over a round out of second place and about four rounds out of first, so it’s time to win more rounds and win races. Point-leader Tanner Gray will start seventh on the ladder after a best pass of 6.614-seconds at 208.14 mph in his Camaro. Coughlin said he didn’t view Gray as “vulnerable” this weekend, even given his mid-pack start. “Tanner’s done one heck of a job this season, despite all the hype, and he’s done a lot of racing in a short period of time,” Coughlin said. “He’s got the right mindset and they usually capitalize on Game Day. We’ve got to be on our best behavior _ everyone in Pro Stock _ for all four runs Sunday.” Gray will race Deric Cramer and his American Ethanol Camaro in Round 1. Krawiec rode to his third pole of the season and 42nd of his career with a third-round pass of 6.873-seconds at 196.07 mph aboard his Screamin’ Eagle Vance & Hines Harley-Davidson Street Rod. That quarter-mile run relegated point-leader Matt Smith to second. Smith had earned the provisional pole Friday at 6.876-seconds and 197.65 mph aboard his Elite Motorsports Denso Auto Parts Buell EBR. Krawiec will open Sunday’s eliminations against No. 16 qualifier Anthony Vanetti and his Suzuki, while Smith is paired with Karen Stoffer and her Suzuki. Eliminations are scheduled to begin at noon, (EDT) Sunday. Top Fuel _1. Clay Millican, 3.726-seconds, 328.54 mph vs. 16. Richie Crampton, 3.942, 303.71; 2. Steve Torrence, 3.743, 327.82 vs. 15. Bill Litton, 3.903, 318.17; 3. Tony Schumacher, 3.745, 329.58 vs. 14. Shawn Reed, 3.882, 283.01; 4. Terry McMillen, 3.777, 324.05 vs. 13. Mike Salinas, 3.859, 313.15; 5. Brittany Force, 3.781, 326.71 vs. 12. Scott Palmer, 3.820, 326.08; 6. Doug Kalitta, 3.789, 319.98 vs. 11. Antron Brown, 3.810, 306.60; 7. Blake Alexander, 3.797, 325.69 vs. 10. Billy Torrence, 3.809, 321.04; 8. Kebin Kinsley, 3.803, 317.34 vs. 9. Leah Pritchett, 3.808, 324.51. Did Not Qualify _ 17. Cory McClenathan, 3.978, 286.68; 18. Terry Brian, 4.121, 237.75; 19. Terry Totten, 4.683, 170.30. Funny Car _ 1. Tommy Johnson Jr., Dodge Charger, 3.918, 321.73 vs. 16. Terry Haddock, Ford Mustang, 5.142, 148.20; 2. Bob Tasca III, Mustang, 3.950, 322.27 vs. 15. Matt Hagan, Charger, 4.169, 255.92; 3. Tim Wilkerson, Mustang, 3.958, 315.64 vs. 14. Jeff Diehl, Toyota Camry, 4.140, 257.38; 4. J.R. Todd, Camry, 3.962, 320.05 vs. 13. John Hale, Chevy Impala, 4.103, 293.03; 5. Jack Beckman, Charger, 3.968, 316.52 vs. 12. Courtney Force, Chevy Camaro, 4.079, 272.28; 6. Robert Hight, Camaro, 3.979, 314.83 vs. 11. Jim Campbell, Charger, 4.051, 310.63; 7. Ron Capps, Charger, 3.986, 317.12 vs. 10. John Force, Camaro, 4.045, 319.67; 8. Cruz Pedregon, Camry, 3.999, 315.19 vs. 9. Shawn Langdon, Camry, 4.003, 310.91. Did Not Qualify _ 17. Todd Simpson, 6.011, 121.84; 18. Jack Wyatt, broke. Pro Stock _ 1. Jeg Coughlin Jr., Chevy Camaro, 6.599, 207.53 vs. 16. Val Smeland, Camaro, 6.747, 206.35; 2. Greg Anderson, Camaro, 6.600, 208.42 vs. 15. Alan Prusiensky, Dodge Dart, 6.666, 205.41; 3. Jason Line, Camaro, 6.601, 207.75 vs. 14. Kenny Delco, Camaro, 6.655, 207.69; 4.Vincent Nobile, Camaro, 6.609, 208.10 vs. 13. Fernando Cuadra, Camaro, 6.641, 208.10; 5. Erica Enders, Camaro, 6.612, 208.33 vs. 12. Chris McGaha, Camaro, 6.626, 208.52; 6. Alex Laughlin, Camaro, 6.612, 206.86 vs. 11. Matt Hartford, Camaro, 6.624, 207.08; 7. Tanner Gray, Camaro, 6.614, 208.14 vs. 10. Deric Kramer, Camaro, 6.623, 208.49; 8. Drew Skillman, Camaro, 6.615, 208.55 vs. 9. Bo Butner, Camaro, 6.615, 208.04. Did Not Qualify _ 17. Shane Tucker, 6.824, 202.61; 18. Robert River, 6.927, 198.79. Pro Stock Motorcycle _ 1. Eddie Krawiec, Harley-Davidson, 6.873, 196.07 vs. 16. Anthony Vanetti, Buell, 7.162, 187.83; 2. Matt Smith, EBR, 6.876, 197.65 vs. 15. Karen Stoffer, Suzuki, 7.015, 190.38; 3. Hector Arana Jr., EBR, 6.882, 195.45 vs. 14. Kelly Clontz, Suzuki, 6.982, 191.95; 4.Angelle Sampey, Buell, 6.906, 194.86 vs. 13. Scotty Pollacheck, Suzuki, 6.950, 193.93; 5. LE Tonglet, Suzuki, 6.915, 194.83 vs. 12. Andrew Hines, Harley-Davidson, 6.950, 194.97; 6. Steve Johnson, Suzuki, 6.922, 194.41 vs. 11. Hector Arana, EBR, 6.946, 195.45; 7. Jerry Savoie, Suzuki, 6.930, 195.22 vs. 10. Joey Gladstone, Buell, 6.943, 193.65; 8. Angie Smith, Buell, 6.933, 192.60 vs. 9. Ryan Oehler, Buell, 6.938, 189.84.